Thank You for Alexander Pushkin! Today, the 6th of June, is his Birthday! To celebrate the day I invite you to open and read the book. The poem “Eugene Onegin” is in the book. Russian painter Elena Samokish-Sudkovskaya illustrated the poem published in 19o8 in Saint Petersburg. It is my pleasure to share with you these wonderful pictures. Romantic mood and delicate character of the poetry embrace us. We are floating in the flows of this Masterpiece. I am catching the waves of “Eugene Onegin” translation by Charles H. Johnston via my own senses. I hope you will enjoy its, you can catch your own Pushkin here. the heart of the professional flirt! So she was called Tatyana. of Richardson and of Rousseau. Tatyana now need wait no longer. with thoughts of him in ceaseless round. is needed, nothing’s left to tell. with scorn to make my world a hell. yet dared not trust what I could see. my tedious taste for feeling free. he sends, a second, then a third. for honour, a straightforward pride. Thank you for joy reading “Eugene Onegin” with me. Onegin Day is wonderful. Thank You for creating the Universe of WordPress. I am floating in Cosmos of inspiring vibrations, emotions and thoughts of a blogger’s planets and stars. 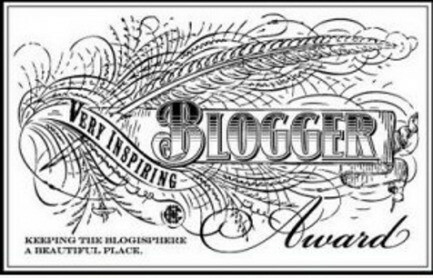 Thank you Petrel41 for the nomination me for the Very Inspiring Blogger Award! I used to be a teacher of the piano. Now I teach my daughter. I learn French. The language is difficult. The last book I have read is “Small Gods” by Terry Pratchett. I love Paris and Vienna. These city are perpetual resources of my inspiration and admiration. “Midnight in Paris” by Woody Allen is the Movie of July. We are going to Bretagne in September. I love a star in orange in the left corner of this page which means you like my post! Thank you. Thank you for this possibility to touch each other planet and share our happy vibrations. Let the words”I inspire!” will our lifestyle credo! Thank You for today’s Inspiration You generously had showered on. 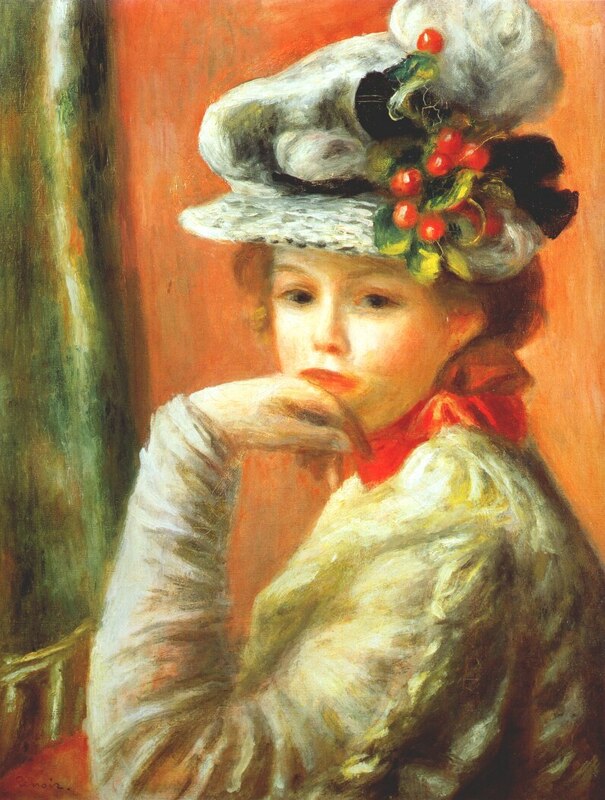 I spent my today with a great impressionist artist Pierre-Auguste Renoir. We were walking in Paris and admiring a parisian women. 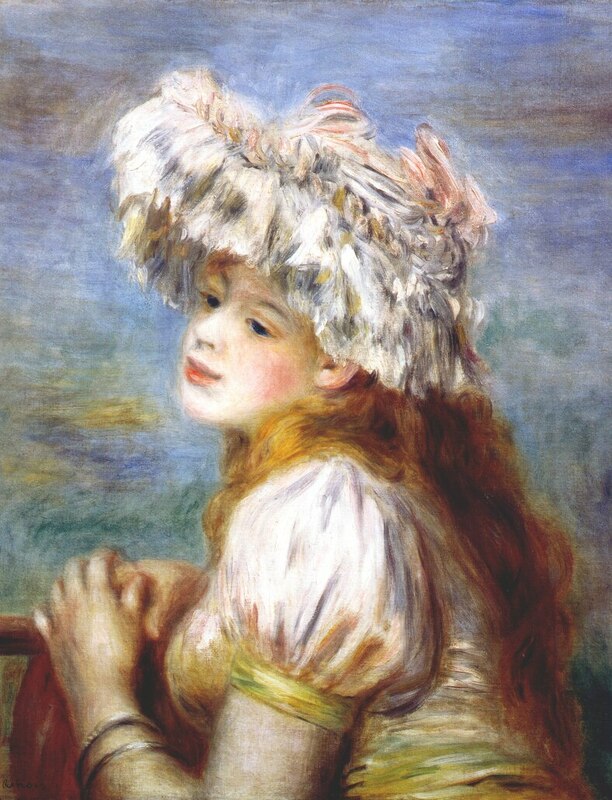 Renoir adores beautiful women. He said humorously that it is better to paint women than love them. 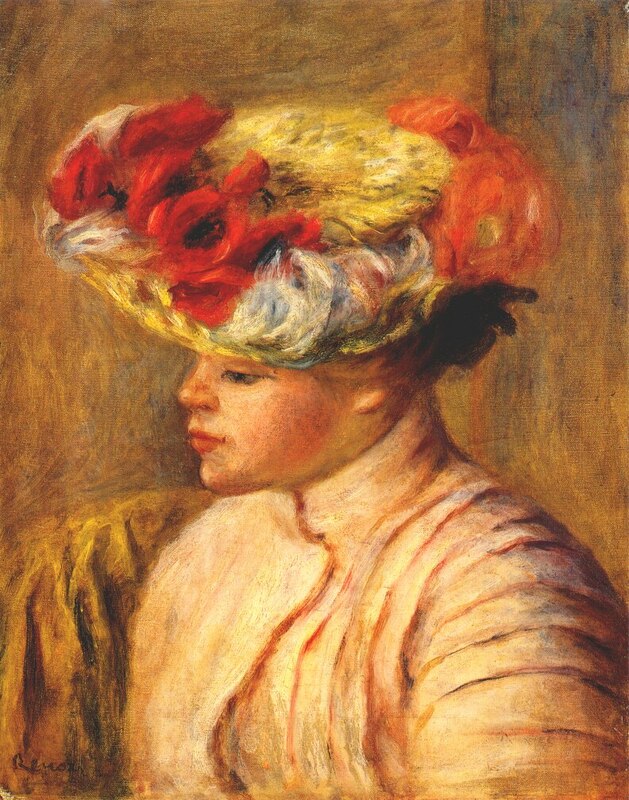 Almost all his woman’s paintings are devoted to la femme a le chapeau. 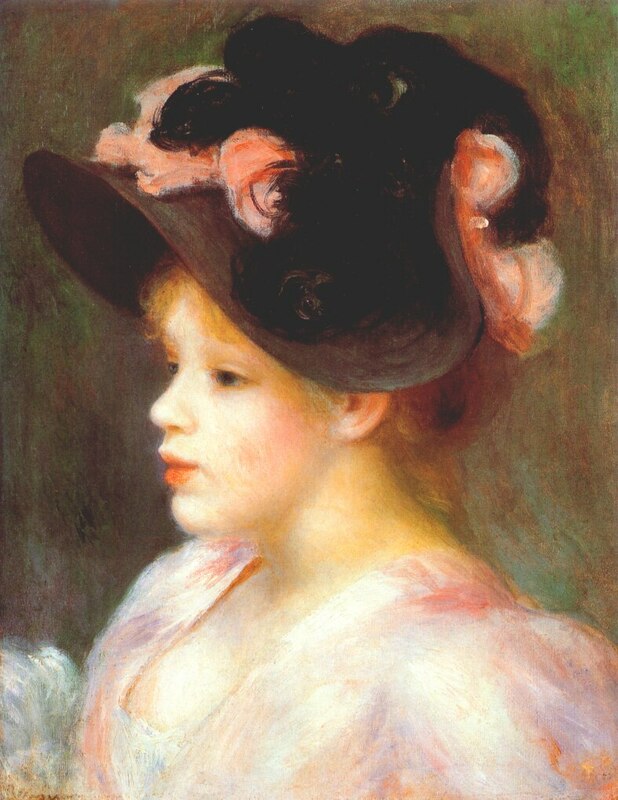 Woman in a hat is a symbol of feminity and charm. “A hat is a flag, a shield, a bit of armor, and the badge of femininity. A hat is the difference between wearing clothes and wearing a costume; it’s the difference between being dressed and being dressed up; it’s the difference between looking adequate and looking your best. A hat is to be stylish in, to glow under, to flirt beneath, to make all others seem jealous over, and to make all men feel masculine about. A piece of magic is a hat,” Martha Sliter said. “Fashion is a kind of communication. It’s a language without words. A great hat speaks for itself.” I love that. “Wearing a hat versus not wearing a hat is the difference between looking adequate and looking your best.” Martha Sliter inspires to buy a hat. “You cannot hide in a hat; you will be noticed, especially by men. To men, you become a lady when you don a hat–one who they rush to open doors for. To women, you become an inspiration, reminding them that they have a closet full of hats they have not had the courage to wear.” The advice is good, I will follow. A woman in a hat is always the ultimate sign of class, poise, and the fervor of a forgotten generation of ever-confident females. 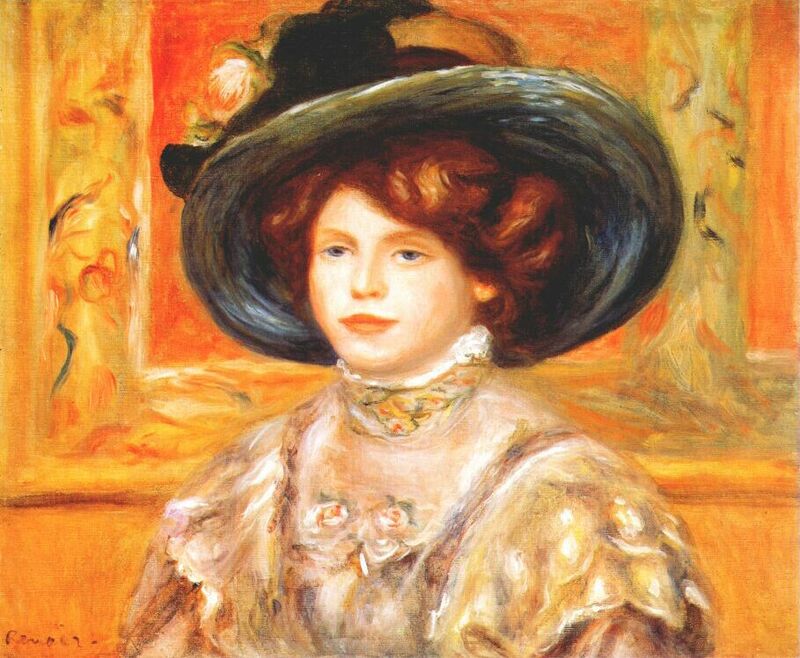 When you see a woman in a beautiful hat, you know she’s not afraid to be seen. I am happy to share this charming video about Le Chapeau. Oh, I am inspired by the idea to buy a hat for myself. I hope you are too. Let’s discover our Beauty in “jeans-and-t-shirt” routine. Our men will be happy!